The Human Immunodeficiency Virus (HIV) has two main strains, HIV-1 and HIV-2. These two strains of HIV are very similar, but they have a few distinct characteristics that set them apart. Overall, HIV-1 and HIV-2 share many traits, including how they are transmitted and contracted, their basic genetic makeup, and that both follow similar pathological processes and develop into AIDS (Acquired Immune Deficiency Syndrome). Typically, when you hear HIV mentioned in general, it is in regards to HIV-1 since it is far more prevalent. 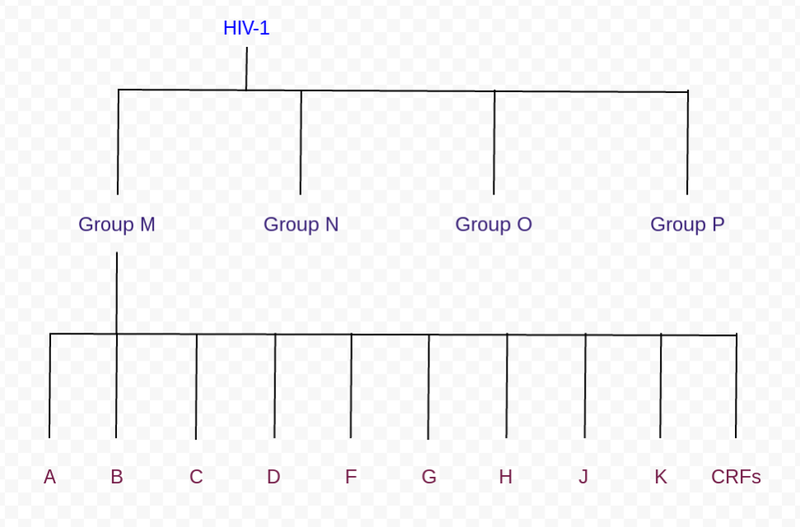 HIV-1 is further classified into four groups: M (the major group), N, O (the outlier group), and P. More than 90 percent of HIV-1 cases involve HIV-1 group M. Within group M lie 10 separate subtypes: A, B, C, D, F, G, H, J, and K, also included are CRFs (circulating recombinant forms) which are essentially hybrid subtypes formed from a mixture of two subtypes; think of them as sub-subtypes. Subtypes A and C are the most widespread geographically, however, subtype B is the most common subtype in Japan, the Americas, Europe and Australia. STDcheck offers the fourth generation ELISA HIV test which reliably detects between both HIV-1 and HIV-2 strains, whereas many other HIV tests commonly test for HIV-1 alone. Our fourth generation test can also detect infections with rare groups and subtypes. We also offer the HIV RNA Early Detection test, which can detect the HIV virus’s genetic material as early as only 9-11 days after potential exposure. Medically Reviewed by Dr. J. Frank Martin Jr, MD on September 21, 2018 - Written by STDcheck Editorial Team.